U.S. human rights and civil rights groups lauded a federal court decision Tuesday that orders the release of 17 Muslim minority Chinese men who have been held without charges for seven years at the infamous U.S. military detention facility in Guantanamo Bay, Cuba. But despite the praise of the organisations, it is uncertain whether the decision will actually mean freedom for the detainees anytime soon. The ruling is the latest in a string of rebukes by the federal judiciary of Pres. George W. Bush’s detention policies of suspected terrorists in Guantanamo Bay, a U.S. naval base leased from the Cuban government. The decision by U.S. District Judge Ricardo M. Urbina calls for the government to end its detention of the men, Chinese Uighurs who were arrested in Afghanistan following the U.S. invasion there, and bring them before U.S. courts to address their status in habeas corpus lawsuits. ‘I think the moment has arrived for the court to shine the light of constitutionality on the reasons for the detention,’ Urbina said, contending that the continued detention of the men was no longer lawful since they lost their status as enemy combatants. In June, a federal appeals court ruled that the U.S. military improperly labeled Huzaifa Parhat, a Chinese Muslim held at Guantanamo Bay, an ‘enemy combatant’. The court ordered that he be released, transferred, or granted a new hearing. Nonetheless, Parhat and his 16 associated have remained behind bars, embroiled in controversies over where to send the men, who said that they had initially fled Western China for Afghanistan because of government pressure and would likely face persecution and possibly torture if they were released to Chinese authorities. But Tuesday’s ruling gives some hope to rights groups that the detainees will finally be released into the U.S. for a hearing before Urbina next week. ‘This is a landmark decision that represents a stinging rejection of the Bush administration’s unconstitutional Guantanamo policies. The situation facing the Uighurs is a stark reminder of the legal and moal quagmire Guantanamo,’ said Jameel Jaffer, the director of the American Civil Liberties Union’s National Security Project, in a statement. ‘The judge was right to rule that this kind of detention is unlawful because the Constitution prohibits indefinite imprisonment without any charges,’ he said. But some of the rights groups remained cautious and urged the government to act quickly to release the Uighur detainees. ‘The government should not drag its feet, but should immediately release these men from their unlawful confinement at Guantanamo,’ said the senior counterterrorism counsel at Human Rights Watch, Jennifer Daskal. In a release from Amnesty International, the organisation said that it was ‘thrilled’ by the ruling, but noted that past rulings from federal courts have fallen on deaf ears within the Bush administration. Despite the pleas and insistence from the rights groups, the Bush Justice Department appears unlikely to cooperate fully with the order. A lawyer for the department, John O’Quinn, asked the judge to stay the order so that the government could consider filing an appeal, but Urbina rejected the request and announced his intention to release the detainees to Uighur families living in the Washington area. O’Quinn suggested that existing laws may force the government to take the Uighur detainees into immigration custody if they enter the United States because they are, the administration alleges, tied to the East Turkestan Islamic Movement, a Uighur separatist group that Washington says has links to al Qaeda. Urbina reportedly reacted angrily to the Justice Departments apparent intentions. ‘All of this means more delay, and delay is the name of the game up until this point,’ he said, insisting that the government leave the Uighurs alone and that the Department of Justice and the Department of Homeland Security would be afforded opportunities to make their views clear in next week’s hearing. 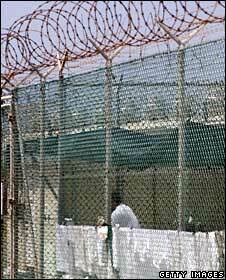 The alleged involvement of the Uighurs in Guantanamo with the separatists’ movement is what initially spurred their detention by the U.S. even though they claimed that they were not in Afghanistan as anti-U.S. fighters but rather to escape harsh treatment by the Chinese authorities. The alleged connection to al Qaeda is what initially got the Uighurs the ‘enemy combatant’ status that the U.S. used to detain prisoners strictly under the authority of the executive branch. But in the summer case of Parhat, the government conceded that while the Uighurs were still designated enemy combatants, they were not considered significant threats or ‘to have further intelligence value’. After the court ruled against the administration in that case, the government decided not to retry Parhat and removed his status as an enemy combatant. The last of the Uighurs were absolved of the ‘enemy combatant’ status in September.